Are you a business owner or employer looking for the ultimate fire safety solution for your organisation? Here at Workplace Fire & Safety Training Ltd we specialise in providing versatile, professional and bespoke courses that comply with the latest government fire legislation so you can rest assured that each and every one of your employees is trained proficiently in the event of a fire. 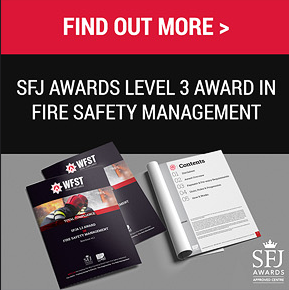 Fire Safety Training is a legal requirement for all businesses in the UK, and our specially designed programs have been designed by specialists who have been trained in the Defence System Approach to Training DSAT model. This ensures you and your staff members courses are being designed by people who have experience of providing 1st class training. Our complete range of courses are a benchmark for Fire Safety Training and risk assessment and our fully qualified instructors have years of experience within the fire services to confidently deliver a service that meets our and your exacting standards. Providing safety for both staff and visitors throughout the UK’s industrial, commercial and public sectors, our fully accredited service ensures your organisation complies with the latest government legislation. All courses provided by Workplace Fire & Safety Training Ltd are designed to meet the legal requirements of Regulatory Reform (Fire Safety) Order 2005 (RRO). Whilst fire certificates have been abolished, existing legislation specifies that every commercial and multi-occupied residential premises should have a responsible person to devise and carry out emergency escape plans and fire risk assessment.